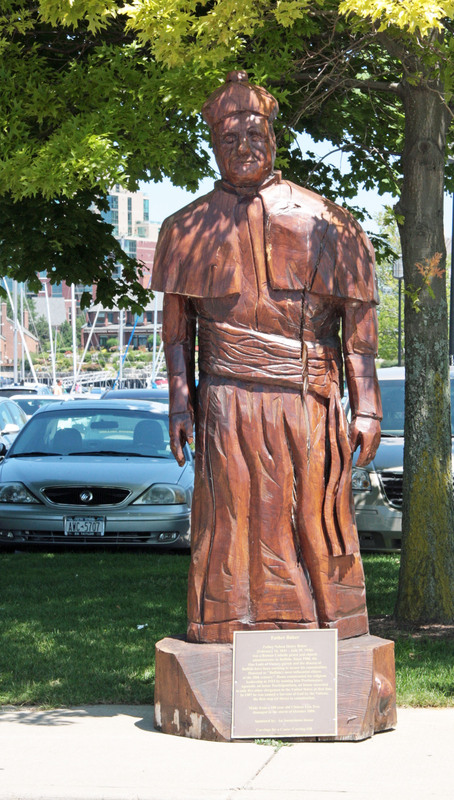 While I was in Buffalo, New York I had a chance to spend some time at the Erie Basin Marina and Garden and came upon some beautiful wooden sculptures, this one is of Father Baker. I read that it is part of the” Carvings for a Cause project”. Monsignor Nelson Henry Baker, familiarly known as “Father Baker,” was born on February 16, 1841 in Buffalo, New York, USA. His father was Lutheran, his mother Catholic. After his early education in public schools, he went into business. In 1868, he resumed his education at Canisius College, Buffalo, as one of its first students. He entered Our Lady of Angels Seminary at Niagara University, New York, in 1870, and was ordained a diocesan priest on March 19, 1876. For five years Fr. Baker served as Assistant Pastor at Lackawanna, then as curate in Corning, New York (then part of the Buffalo Diocese). In 1882, he was recalled to Lackawanna as Superintendent of the Institution destined to become Our Lady of Victory Homes of Charity, with an orphanage, industrial school, home for infants, facilities for unwed mothers, and maternity hospital. Father Baker was named Vicar General of the Buffalo Diocese in 1902, a Domestic Prelate in 1905, and later raised to the rank of Prothonotary Apostolic. He promoted devotion to the Eucharist and Our Lady of Victory. He built the Basilica of Our Lady of Victory, which was consecrated in 1926. Father Baker administered the Basilica Parish with the adjacent homes of Charity, for the rehabilitation of countless underprivileged men, women and children, until late in life. Father Baker died on July 29, 1936 in Lackawanna, New York. In the Summer of 1987, the Congregation for the Causes of the Saints approved the initiation of Father Baker’s cause and confirmed the title “Servant of God – Nelson Baker”. The question confronting the Church today is not any longer whether the man in the street can grasp a religious message, but how to employ the communications media so as to let him have the full impact of the Gospel message. This entry was posted in Photography and tagged arts culture, Buffalo New York, I’m Posting every day in 2011, Inspiration, Photography, Quotes, thoughts. Bookmark the permalink.